Chanie Apfelbaum’s son Peretz is allergic to peanuts, cashews, pistachios, flax seeds, mustard seeds, coconut, peas, eggs and beef. Some of the foods give him hives, but the nuts can send Peretz into anaphylactic shock. Managing severe food allergies is stressful and can cause a lot of anxiety, but this 36 year old mother of five and kosher food blogger behind Busy in Brooklyn, decided to take action. 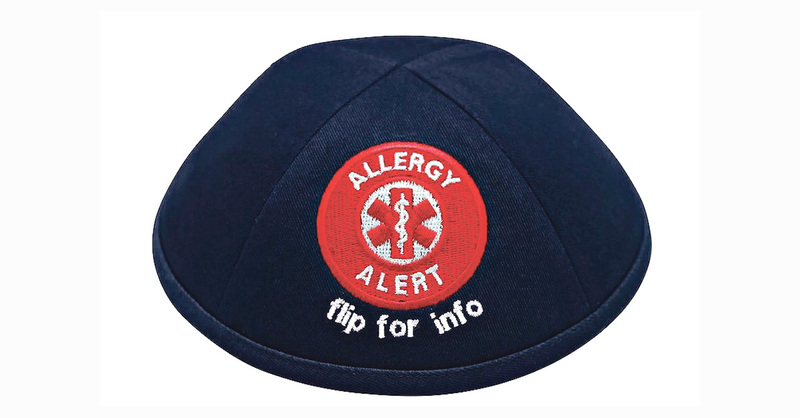 Chanie came up with a simple, clever idea to notify others that her son has severe allergies with an “allergy alert” kippah. Chanie helped design the skullcap with a Brooklyn-based company iKippah, an online retailer of colorful and bright kippahs. The skullcap is navy blue with a red circle on the front that contains the words “Allergy Alert.” It also says “flip for info” and allows users to write down the child’s allergies on the underside. The “Allergy Alert” kippah is available in denim as well. Her son Peretz used to wear an allergy bracelet, but Chanie feared it wasn’t prominent enough for others to see. 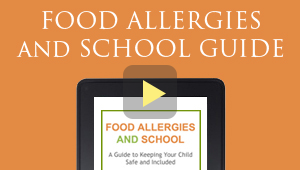 The kippah is an excellent way to inform anyone serving food to an allergic child that they need to be careful.